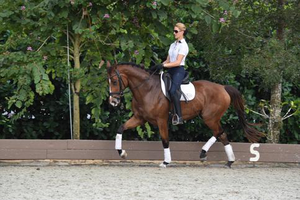 This is a 2014 KWPN Mare by the famous Johnson out of an Anrijetto Mare standing 16h tall. Breathtaking looks and movement, this is one for the big ring and international competitions. This horse will blow everybody away with her freedom in the shoulders and a very strong motor and active hind leg. 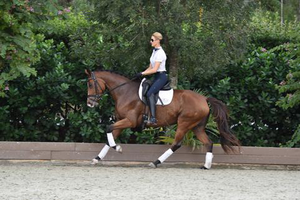 We love her elegant movement and her modern built, there are many reasons to look forward to a bright future in the highest levels of dressage with this young beauty. Khalessi has definitely three above average gaits, all clear and already well balanced with a good rhythm, which will get even better with age, more muscles and more experience and training. She is a dream for every rider! There are no limits for this mare, with both parents having competed successfully at the international Grand Prix, she will compete in the big ring and she will be a phenomenal FEI horse. You can be sure to attract attention at the show with this beautiful horse. She is very elastic and a fast learner, she works with schwung and ease, making the perfect horse for everybody alike, for a young rider, an adult amateur, a professional or even an older person looking for the perfect young horse for the future, without sacrificing the super gaits and the ability to go all the way to the top with a future FEI horse. This horse is a true diamond in the rough, she loves to learn, is easy to sit and light in the hand. Khalessi is a safe horse, especially for her age and gets even ridden without the fuzz of longing first. Khalessi is a horse that does what she is asked to do. Nothing seems too much for her and she always gives 100%. She has super nerves and perfect ride ability. Friendly and sane in the barn and under saddle, she is a magnet for everybody alike, loves to cuddle and thrives for attention. Current clean xrays are on file. Viewed 316 times since 1/20/19.